Depending on the performance and price you're looking for, you can find basketball rims and nets to fit any budget and basketball court. Heavy-duty rim that actually "breaks away" from the backboard during a slam dunk to keep the backboard from cracking. Double rim provides greater strength and durability. Perfect for outdoor playgrounds. Fixed rim that bolts to the front of the backboard. Fixed rim that bolts to the back of the backboard. How about some indoor fun perfect for kids of all ages! These indoor mini goals even have breakaway rims, so you can fulfill those fantasies of slamming the ball...all day long! 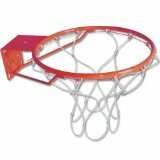 Whether you're shopping for a portable basketball hoop or an in-ground basketball system, you will need to consider the type of rim and net you want. 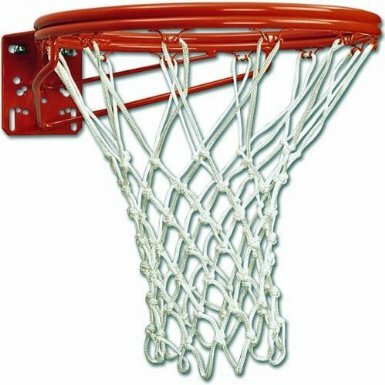 The standard basketball net today is 15 inches long and made out of nylon cord with loops that attach to hooks on the rim. When shopping for a basketball net you've got 3 basic styles to choose from: nylon, chain, and cable. Nylon nets are the most popular kind of net. They are the kind used in regulation competition. You can get them in a variety of colors, including bright neon. For having a little shooting fun in the dark, you can even buy some that are lighted! Used mainly on playgrounds and outdoor courts because they are sturdy and harder to vandalize. 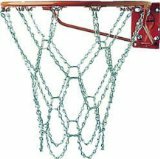 Used mainly on playgrounds and outdoor courts for the same reason as chain nets. In 1892, when Lew Allen of Hartford, Connecticut came up with the idea to replace the peach basket with a cylinder-shaped basket made out of heavy woven wire, he had no idea how he was about to change the course of basketball history forever. His first rim was made by bending a piece of heavy wire into a circle about 18 inches in diameter. It's amazing to think he set the standard for the rim size that we still use today. In the mid-1930s, the National Association of Basketball Coaches experimented with expanding the rim to 20 inches, but they decided after a few years of research that 18 inches was a good size. 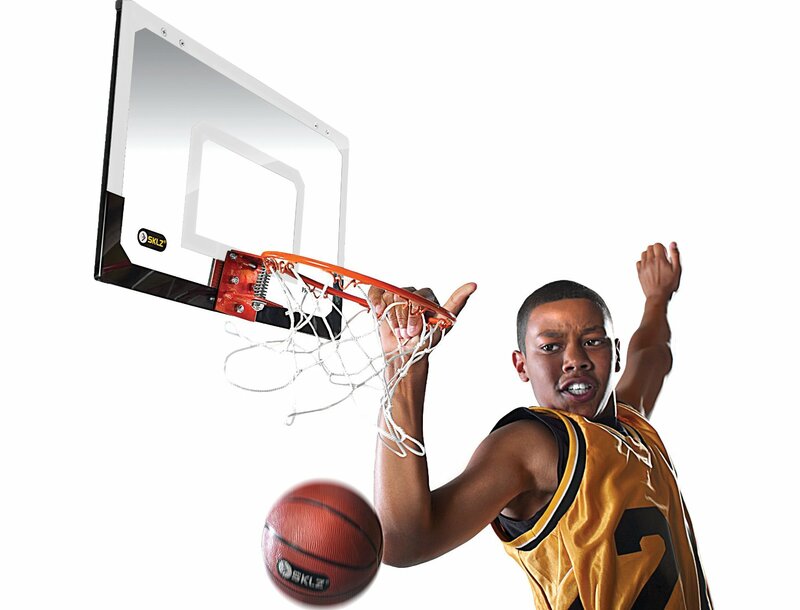 The next major advance in the design of the basketball rim wasn't until 1975 when the popularity of the slam dunk led to the introduction of the break-away rim. 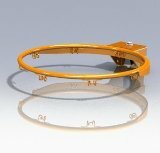 This new design allowed the rim to "break away" on impact and then snap back into place without damaging the backboard. In the early years of the game, the wire net actually had a wire across the bottom to keep the ball from falling through. Every time a shot went in, someone had to use a long pole to poke the ball out or climb a ladder to get it out. 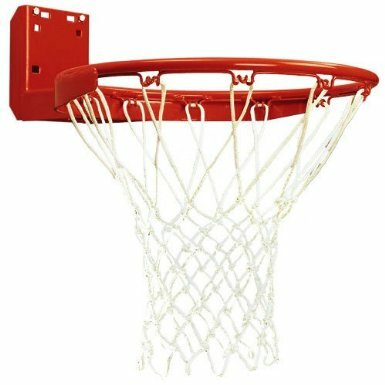 In 1893, a cutting edge inventor came out with a basketball goal that had an iron rim, a cord basket, and a pulley and chain system which tipped the basket like an old flush toilet. It wasn't until 1906 that folks started experimenting with nets open at the bottom, but these open nets didn't become legal until the 1913-14 basketball season. I saw a picture from the 1916 Rawlings Sporting Goods catalog of a cord net with a drawstring which allowed the net to be left open for practice or closed for games. In 1937, a cool invention came on the scene called the "Bask-o-Lite," which paved the way for the lights on the backboard we see in modern games today. 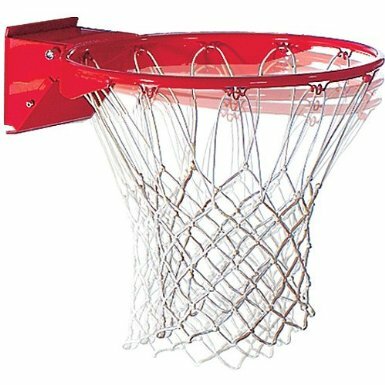 The Bask-o-Lite was a rim with a lever stretched across the opening below the net. Every time the shot was made, the ball would trigger a light behind the basket to verify that a goal had been made. The whole point of experimenting with basketball goal design was to improve the game and the speed at which it could be played. 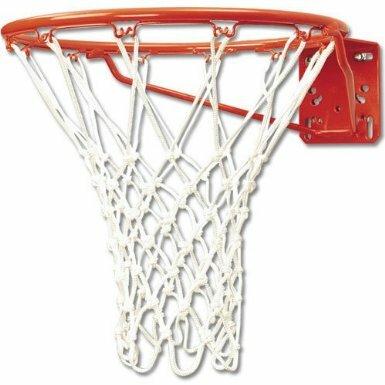 Amazing to think how something as simple as basketball rims and a basketball net could impact the quality and pace of the game as we know it today!